Zelda Themed Shield Holder-Display #3DPrinting #3DThursday « Adafruit Industries – Makers, hackers, artists, designers and engineers! Made this for a friend to hold his Zelda replica items, which are made of metal. 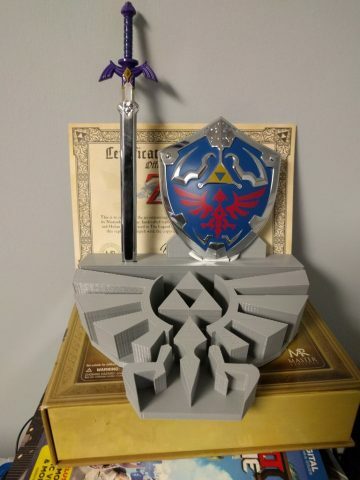 It’s the Hylian crest with a holder for the shield, sword, and the certificate if you want to put it in the back. The left side has two holes, one round and one rectangle. The rectangle is for the sword tip and the round is for the sword hilt, so you can display it either way.